Someday, there will be a definitive article on precision medicine and what it means to all men with prostate cancer and their families. Precision medicine offers a lot of hope – but not for everybody, right at this particular moment. This will surely change: as more drugs are developed to target different genetic mutations that cause cancer, the number of men who can be helped by these drugs will grow. For now, though, precision medicine is a bit of a medical can of worms that raises as many questions as it answers. Why is this? For one thing, it’s still so darn new. For another, many doctors don’t yet understand how mutated genes influence risks, screening decisions, and treatment options for prostate cancer. And for still another, most urologists and medical oncologists didn’t sign up to be genetic counselors; that wasn’t in the job description when they hung out their shingle – which means they are learning as they go, just like the rest of us. Recently, PCF-funded scientists discovered that about 16 inherited bad genes (sometimes referred to as “germline genetic mutations”) can run in families. These genes can cause not only prostate cancer, but breast, ovarian, colon, pancreatic, brain, or other forms of cancer. This discovery also means that if you have a history of other forms of cancer in your family, you might have a higher risk of getting prostate cancer. Nor do the tests, or the guidelines, offer any advice for young men. “Genes aren’t necessarily our destiny,” says Simons. “Just because you have a bad gene that runs in the family, it doesn’t inevitably mean that you are doomed to get cancer. It just raises your risk.” This early knowledge provides a great opportunity for people in higher-risk families: “I believe in your twenties, it’s incredibly important to modify your lifestyle and cancer risk.” While there’s no dietary magic bullet, there are some things any man can do to lower his risk of getting aggressive cancer: don’t smoke, lose weight, exercise, and stay away from inflammatory agents like sugar, fatty fried foods, and charred meat. But you can’t know that you’re at higher risk if you don’t know cancer runs in the family. Many men who are diagnosed today are surprised to find out that their fathers or grandfathers had prostate cancer – and nobody talked about it. How many in today’s generation of men diagnosed with prostate cancer, if they know they have a genetic mutation that contributed to the disease, are talking with their own kids? “Many men feel that they don’t want to burden their children who are in their teens and twenties with worry about prostate cancer because they feel they can’t do anything about it,” notes Simons. Is that the right decision? Nobody knows for sure. And then there’s the shortage of prostate cancer-savvy genetic counselors. For years, the mainstay of genetic counselors has been working with pregnant women or women with breast cancer – not men with prostate cancer. So there’s some catching up to do. Well, that all said, let’s take a look at precision medicines for some of these cancer risk genes. What is Precision Medicine, and Who Can Benefit From It? Precision medicine is a hot topic for a very good reason: for some men with advanced cancer, it offers new hope when other treatments have failed. But it’s not for everybody. It’s ultra-specific, and for now, this particular glass slipper only fits a few tiny genetic feet: mutations in at least 16 “DNA repair genes”, most commonly in the genes BRCA1, BRCA2, and ATM. However, people with other mutated genes including FANCA, CHEK2, PALB2, HDAC2, MRE11, and NBN have responded to the drug olaparib (discussed below). At the moment, finding precision medicine is rather like getting really good truffles in France: you have to know where to go, and whom to talk to, and nobody makes it easy. Some promising treatments are still in clinical trials. Good news here: You can be part of a clinical trial, even if you aren’t anywhere near the particular hospital where the trial is based. Talk to your doctor about which one might be best for you. Soon, the PCF website will have a portal where you can investigate clinical trials for prostate cancer. Until then, you can also look for clinical trials (not just of gene-targeted treatment, but for many treatments for prostate cancer) on clinicaltrials.gov, a website operated by the National Library of Medicine. Is Precision Medicine For Me? That’s the big question. How do I know if I have a bad gene? There are several ways. One important clue is your family history – not just of prostate cancer, but of other cancer, too. Back to those 16 bad inherited genes we mentioned above: they’re involved in DNA repair – keeping the genetic code free of errors. If a genetic mutation knocks out the body’s quality control officers, cancer can result, and this mutation can be passed on to sons as well as daughters. This means, that the same gene-targeted treatment could work just as well for a man with prostate cancer as it does for a woman with breast or ovarian cancer – if, that is, they both have the same mutated gene. Inherited (germline) faulty genes can be detected with a genetic test, mentioned above. These and genes that just up and mutated on their own in the tumor cells (called somatic mutations) can also be detected in genetic testing of your original prostate biopsy or prostatectomy specimen, but if you have advanced disease, an even better test is a biopsy of a metastatic tumor. That’s because as prostate cancer evolves, more genes may be mutated. Note: not all genetic tests available look at genes relevant to prostate cancer; ask your doctor how to make sure you get the right test. If you have a mutated DNA repair gene such as BRCA1 or BRCA2, your cancer may respond particularly well to a type of drug called a PARP inhibitor. There are several, including olaparib and rucaparib, and they work by keeping cancer cells from repairing damaged DNA. Tumors, just like Xerox machines, need basic maintenance to keep making new copies; without it, they break down and die. These drugs have been FDA-approved for use in ovarian and breast cancer, but men with prostate cancer who have DNA repair gene mutations have responded well to these drugs in clinical trials, too. Men with DNA repair gene mutations may also respond well to platinum chemotherapy drugs, which are more widely available and are used to treat several different forms of cancer. How Do I Find Out if I Have an Inherited Cancer Risk Mutation? You really need a genetic counselor, and the problem here, mentioned above, is that the field of prostate cancer treatment is scrambling to catch up in this area. “The access to genetic counseling and genetic services for men with prostate cancer is certainly not universal,” says medical oncologist and PCF Young Investigator Heather Cheng, M.D., Ph.D., who started the country’s first genetic counseling center specifically for men with prostate cancer at the Seattle Cancer Care Alliance. The good news, she adds, is that clinical trials will help raise awareness in medical oncologists – who then will know that for patients with these mutations, there are extra weapons in the arsenal that may prove very effective. Cheng believes the not-too-distant future will see some hospitals becoming centers of excellence where genetic counselors will stay up-to-date on the latest research and be able to offer advice “in real time” as new findings come in. She believes counselors at these centers will be able to talk to patients anywhere in the country through telemedicine or web-based conferencing. “I get very excited about the potential impact. Even for people with a family history of breast and ovarian cancer or Lynch syndrome (an inherited genetic condition that carries a high risk of certain cancers, particularly colon cancer), the rate of genetic testing is way lower than it should be. Doctors should be pushing this more.” At the PCF, we believe that patients should be pushing for this, too. Does Insurance Cover Precision Treatment? But remember: “It’s still not the majority of men with prostate cancer who are going to fit into this category,” Cheng notes. “Even in the metastatic setting, it’s still not even half. It’s a subset.” Consult your doctor about whether you might be a good candidate for genetic testing based on the specifics of your prostate cancer. Janet Farrar Worthington is an award-winning science writer and has written and edited numerous health publications and contributed to several other medical books. 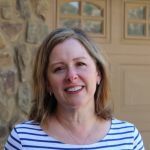 In addition to writing on medicine, Janet also writes about her family, her former life on a farm in Virginia, her desire to own more chickens, and whichever dog is eyeing the dinner dish.